Candidates with Master's degree in Management, Commerce or Social Welfare from Calcutta University, with 55% marks in aggregate (SC/ST with 50% marks) or with 60% marks in aggregate of any other recognized University from any discipline. Through written test and personal interview. Candidates who have cleared NET/SET or equivalent national level examination will be exempted from entrance test. Available from the reception counter of IISWBM on cash payment of Rs. 600/-. Application form may also be downloaded from our website www.iiswbm.edu and payment made through State Bnak of India Power Jyoti Account of IISWBM NO. 32495656710. For details refer to our website. For student loan, we have arrangement with some banks subject to fulfillment of respective banker's formalities. Last date of issue and receipt of completed Application Form is 17/08/2015. 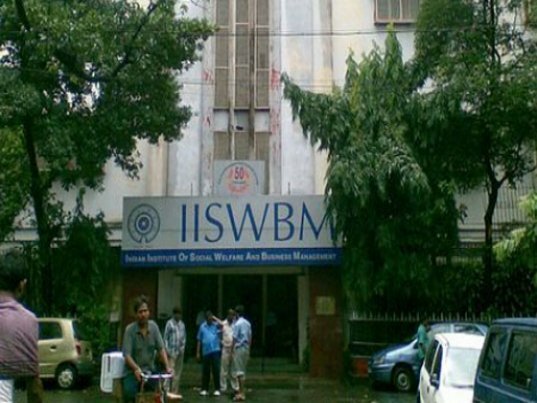 IISWBM has been awarded the ABP national award "Best outstanding B-School (East), 2015"